(CNN) -- Lance Armstrong is the star attraction in the 100th edition of the Giro d'Italia but has played down his chances of overall victory in the first major Tour of the cycling season. 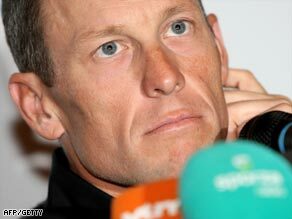 Armstrong is expected to support teammate Leipheimer in the Giro. The 37-year-old American is riding in the Giro for the first time, but a crash at a minor stage race in Spain in March left him with a shattered collarbone and with his chances of competing in the balance. The seven-time Tour de France champion is made of stern stuff and after surgery was quickly back on his bike, but is realistic about his chances on the grueling three-week tour. "This was a difficult setback, but I don't think that it's a bad thing," he told his Web site www.livestrong.com. Armstrong added that his Astana team were looking to fellow American Levi Leipheimer for overall victory.
" I think the team will be coy about our chances in the Giro, but I think we have a strong guy (Leipheimer) and that works perfectly for me. "I get to ride with no pressure, do an event that I've always wanted to do and get to help a guy try to win the Giro." Team Columbia chief Bob Stapleton, whose squad has compiled an impressive slate of victories going in the Giro, told CNN in an exclusive interview that Armstrong would be hard-pushed to claim overall victory, but would ride strongly. Stapleton and a number of leading experts are predicting victory for home hope Ivan Basso, who has returned this season following a two-year doping ban after being implicated in the Spanish blood-doping scandal Operation Puerto. Leipheimer is also aware of the danger presented by the classy Italian and made his own prediction on livestrong.com. "I see the GC (general classification) race being between Ivan Basso (Liquigas), Danilo Di Luca (LPR Brakes), Dennis Menchov (Rabobank), and Armstrong / Leipheimer (Astana)," he said. The race starts with a short team time trial in Venice on Saturday, with Stapleton's Team Columbia and the Garmin, Astana and Saxo Bank squads expected to feature. Stapleton has high hopes that his star rider Mark Cavendish of Britain will be in the race leader's pink jersey after the first three stages. "Stages one and two after the team time trial suit Mark very well and if all goes well, maybe we'll see Mark in pink. Leading the race is our ultimate goal." Sprint star Cavendish won two stages in last year's Giro, four in the Tour de France, and claimed victory in this year's Milan-San Remo classic. He will face tough opposition on the flat stages from Italy's Alessandro Petacchi, but they will have few opportunities before a series of tough mountain stages to mark the centenary Giro. The race ends ends on May 31 with an individual time trial in Rome. Armstrong is using the race as further preparation for his bid for an eighth Tour de France victory in July where he is set to be part of a formidable Astana squad including Leipheimer and 2007 champion Alberto Contador who is not defending his Giro title this year.